For the Valero im focusing accuracy on off the tee and guys who hit a high GIR%. Also added Martin Piller to Knox and Si Woo. Basically avoiding the bombers, so that rules out the likes of List and Holmes for me. Not sure if Lists recent form is the real deal or if he will blow up somewhere soon. ah I see. You’ve the research done. List is one of the favs all the same. He hits the ball an absolute mile. He’s pretty hot with his irons as well though in fairness. Schauffele could be a decent bet too. He’s been steady enough without contending. Tidy iron player. Id agree with you on List’s form. Hard to know whether he’ll stay on the scene or just become another journeymen. Was considering adding him to my list of US Ryder Cup likely lads! the research is not paying off this week. 2 still in touch , but hard to see a winner from them. Same applies for List! Long way to go though. And no marquee players at the top yet. Schauffele 3 over, good luck! McIlroy missed the cut at the Players’ Championship. European captain Thomas Bjorn has named Lee Westwood, Padraig Harrington, Graeme McDowell and Luke Donald as vice-captains for this year's Ryder Cup against the United States. Ah but really?! I think the nonsense around the Ryder Cup is on a par (smoooth) with the Eurovision. It’s a big unimportant, TV-driven heap of rubbish and more bizarre now than ever - Brit golfers with the EU flag wrapped around them?? Spare me. I disagree with so much of this post, that I actually cant summon the energy to dissect it. 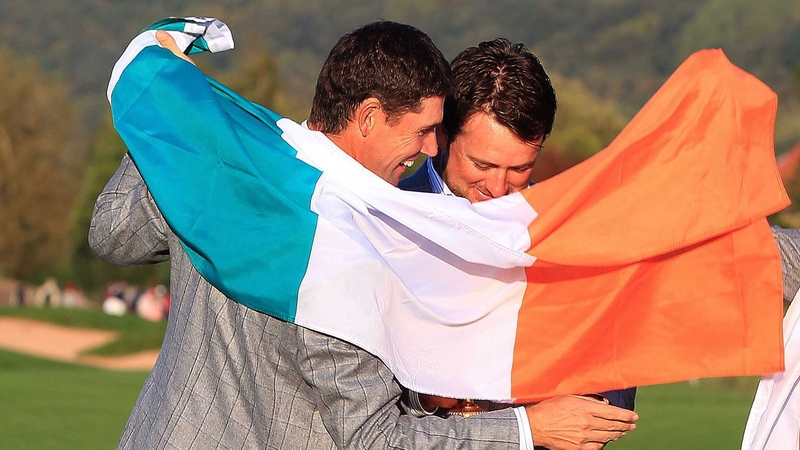 It’s great drama, with the best players in the world (bar one or two), playing an intriguing (good for TV) format, where guys that are playing on an island (not Donabate) for most of their careers, get to feel the sensation of a team sport. It brings out the best in some (Poulter is a great example of this…he is also a c*ck, but still a good example) and the worst in others (Tiger in the early years, lots of other US examples). It is great viewing IMO, so I suggest you just don’t tune in. Many many others will. You won’t dissect it cos it’s all fact! I was on Leishman and Walker myself. Thought I was quids in but good each way coin regardless. Saw JJ’s interview afterwards. He spoke that he really fancies his chances at Colonial. Aaron Wise looks a major champion in the making. Might even pull it off this season. Definitely a value bet for the two remaining on Stateside. I didn’t see him play a bad shot Saturday or Sunday. Drives the ball an absolute mile. And he has Tigers psychology coach from his earlier years. A scary combination. Kirk flirted with a high finish all week but finished just outside the top 10. Still some good signs so ill be on him again this week. Also on Kevin Tway for the memorial along with Russell Knox. Feels like I’ve been on Knox forever so maybe this is the week he does something, should be suited to Memorial. Opportunity Kn… nah doesn’t matter. this place loves a pun. Of course Kirk comes up with a 6th place finish a week after i was on him! US Open this week, wind looks like it is going to be a factor so might need to see a forecast closer to tee times before making any picks. McIlroy, Speith and Mickleson are all doing there best to get the weekend off work. carnage out there. Hopefully Grace and Lieshman can hang on the next 2 days so ill have some interest over the weekend. McIlroy +6 after 5, Spieth +5 after 5 … that’s the kind of scoring I’d be doing! Justin Rose in the club house at one over, and he’s the bookies favourite. Pin positions a nightmare. Wind is up. And if you miss a fair way you’re goosed. Hopefully Stenson with his trusty 3 wood can plot a safe course. Each way on Finau for a laugh.